My answer is, “William Howard purchased the island from Richard Sanderson who inherited the island from his father, also named Richard Sanderson. That Richard Sanderson bought the island from English Quaker, John Lovick, who was granted Ocracoke by the Lords Proprietors. In 1663 & 1665, eight Lords Proprietors were granted the territory of Carolina (at that time, all of the land between 31° and 36° north latitude, and extending from the Atlantic to the Pacific) by Charles II, King of England, Scotland, and Ireland, and newly restored to the English throne. In 2015 Dale Sanderson, a direct descendant of the Sandersons visited Ocracoke on a journey tracing his family roots. You can read about that visit here: http://www.ocracokecurrent.com/107262. The elder of the two Richard Sandersons (c. 1665-1733) was a sea captain, and probably born in Currituck County, NC. He served as justice of the Currituck Precinct Court, was later a justice of the General Court, and at various times held seats in both the lower and upper houses of the Colonial Assembly. He was active in the militia, and was a vestryman in his Anglican parish. Richard Sanderson. Sr. was also owner and master of several sloops and brigantines, and had extensive land holdings in coastal North Carolina, including, as we know, Ocracoke Island. He regularly sailed along the coast as far as the West Indies transporting trade goods. 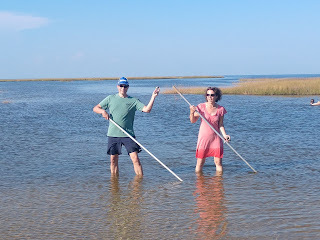 Sanderson, as well as the previous owners of Ocracoke, never lived on the island. He used the island merely to raise horses, cattle, sheep, and hogs. At Sanderson’s death the ownership of Ocracoke Island passed to his son, also named Richard. In 1759 the younger Sanderson sold the island to William Howard for 105 British pounds. William Howard, who may have been one of the early pilots at Ocracoke Inlet (as well as Blackbeard’s quartermaster), was the first European owner to make his home on the island. This month's Ocracoke Newsletter is Lachlan Howard's essay about the Fresnel Lens and its use in theater, solar ovens, cameras, and industry, as well as lighthouse illumination. You can read it here: https://www.villagecraftsmen.com/the-fresnel-lens/. Carl Goerch's 1956 book, Ocracoke, is a classic description of this most isolated island on the Outer Banks. To my knowledge, it is the first book published specifically about Ocracoke, and well worth reading in order to get a sense of island life just as increasing numbers of visitors were starting to discover Ocracoke. But who was Primrose? The artist is not acknowledged anywhere else in the book or on the jacket. This is what I have discovered. 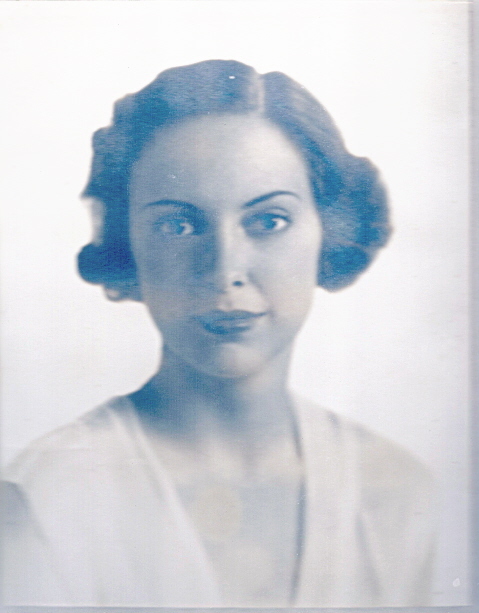 The today little-known Primrose McPherson Paschal was born in Raleigh, North Carolina, in 1915. Primrose McPherson's ancestral family of Scottish and Welsh heritage was prominent in North Carolina from the time of the American Revolution into the twentieth century. At an early age Primrose was interested in art, and started formal training when she was nine years old. As a student at Peace Institute (Primrose matriculated in 1929) she excelled in art, acting and writing. After graduating from Peace College in 1933 she continued her training at Parsons School of Fine and Applied Arts in New York City where she was a member of the Art Students League of New York. After returning to Raleigh Primrose continued her pursuit of art. 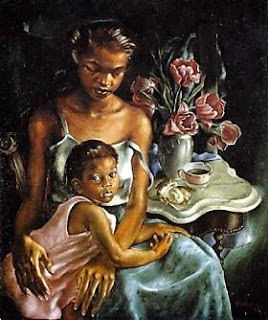 In 1935 she was elected as a member of the North Carolina Professional Artists Society. From 1937 until 1948 Primrose was married to Malcolm Robertson. While awaiting a divorce she lived in Key West, Florida, where she was befriended by Ernest Hemingway. After returning to Raleigh she married Joel Francis Paschal, a Raleigh attorney and law professor at Duke University School of Law. She became a prominent participant in the cultural and artistic scene in Raleigh and Durham. 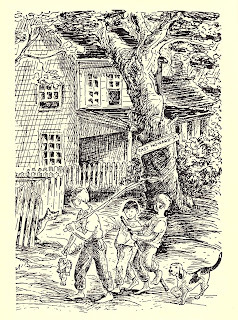 Primrose Paschal illustrated a number of children's books as well as Goerch's Ocracoke, and created many beautiful paintings that can be found on the walls of courtrooms, museums, and private homes throughout North Carolina. She was particularly adept at portraits. In 1948 she painted "Beulah’s Baby," a moving portrait of a black woman and her child. This painting won the annual purchase award at the North Carolina State Art Society's exhibition. It is now part of the North Carolina Museum of Art's permanent collection. Prints of this painting are available in nearly every African American Gallery selling Black Art. Primrose was active in the art world from the 1930s into the early 1980s. She died in 1998 in Cary, North Carolina. Until Hatteras Inlet opened (in 1846) Ocracoke Inlet was a busy passage for ships sailing to and from mainland North Carolina ports. However, many ships were too large and drew too much water to safely navigate shallow portions of Pamlico Sound. In 1753 Portsmouth, on the south side of the inlet, was established as a "lightering" village. Cargo was transferred from larger ships to smaller, lighter boats for transport to the mainland. By the 1770s Portsmouth was one of the busiest and largest communities on the North Carolina coast. In 1840 more than 1,400 sailing vessels passed through Ocracoke Inlet. But the opening of the more navigable Hatteras Inlet in 1846 was the beginning of steady decline for Portsmouth. Subsequent storms as well as the disruption from the Civil War and the growing importance of railroads (which led to the decline of coastal shipping) eventually led to the total abandonment of Portsmouth village. The last residents left the island in 1971. You can read more about Portsmouth here: https://www.nps.gov/calo/learn/historyculture/portsmouth.htm. Outer Banks historian and author, David Stick, put together an anthology of selected and edited writings which were published in 1998. 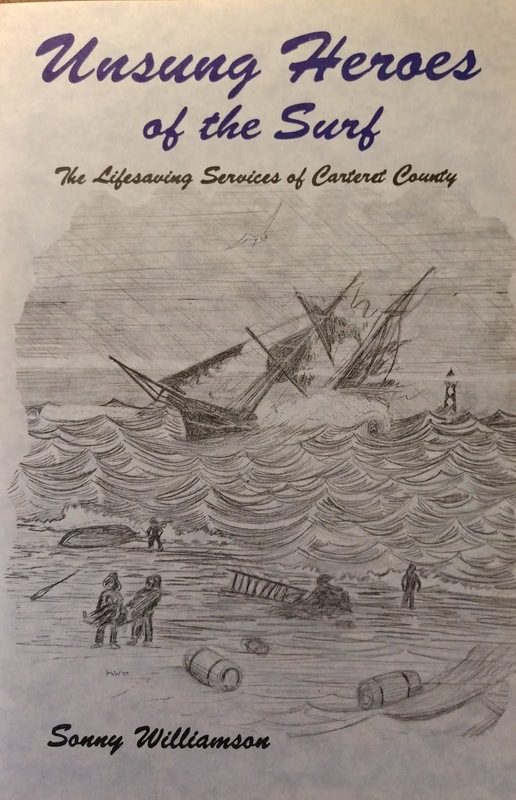 His An Outer Banks Reader includes a fascinating section titled "Man versus Nature" in which he shares portions of 1884 letters by Hatteras Island native and pilot, Redding R. Quidley, regarding Hatteras Inlet, which was created by a hurricane on September 7-8, 1846. Quidley, who lived at Hatteras, was a licensed pilot at Ocracoke Inlet in 1831. He writes that he would pilot vessels across Ocracoke Inlet 2 - 4 times a week...and then to walk (!) home to Hatteras which was then connected to Ocracoke. There was nothing to suggest that a new inlet would form. 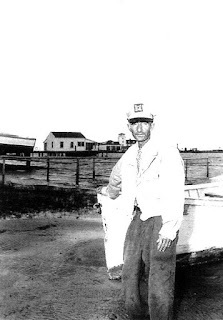 In fact, he says, several families lived where Hatteras Inlet is today. Live oaks, yaupons, fig & peach trees, and vegetable gardens were growing there. When Quidlety was writing, 38 years after the inlet formed, Quidley says there was three or four fathoms (18 - 24 feet) of water where homes and gardens once stood. Today Hatteras Inlet is a major waterway allowing commercial and sports fishing vessels passage between Pamlico Sound and the Atlantic Ocean. Ocracoke Inlet, which has been continuously open since Europeans first explored this area, and was the primary passage into Pamlico Sound, soon yielded to Hatteras Inlet after the 1846 hurricane. Quidley writes that "there has been very little passing through Ocracoke Inlet since 1855; there is no vessel pass [sic] through there now except perchance, that a vessel goes in case of distress of weather...."
Just a few months ago the Humanities Extension/Publications Division of the North Carolina State University published a short book by Ocracoke native, Chester Lynn. Many visitors to the island know Chester as the Proprietor of Annabelle's Florest and Antique Shop on the Back Road. Chester is also the island's resident expert on figs and fig trees. 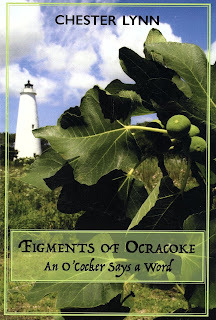 His book is titled, Figments of Ocracoke, An O'cocker Says a Word. 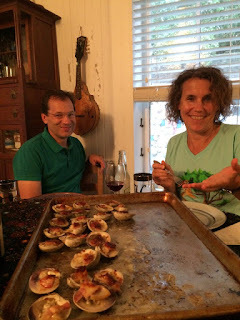 Figments has chapters on Ocracoake Island history & stories, types of fig trees, tending fig trees, and cooking with figs. As collaborator on the text, Walt Wolfram, the William C. Friday Distinguished University Professor and Director of the NC State Language and Life Project, writes in the Preface, "to know Chester to recognize that he can 'say a word' -- and can recount history, lore, and wisdom on everything from figs to the Lost Colony." Wolfram explains that, "in this collection, Chester tells his story -- from his childhood obsession with figs to his assortment of antiques that includes treasures from Blackbeard found at Springerr's Point to plates from South America dug up in his backyard." On your next stroll down Back Road stop in at Annabelle's Florest and chat with Chester...and purchase one of his books. You'll be glad you did! "On a recent stroll down the beach, I saw, among other things, a Florida coconut, a piece of wood painted with Chinese or Japanese characters, several full cans of emergency drinking water used on Coast Guard life rafts, a bottle inscribed with the words “Republica Dominicana, Rentas Internas,” two unopened gallon tins of sauerkraut and lima beans, an abundance of shells and driftwood, a large hunk of coral and a transparent glass net float, about the size of a cantaloupe, the kind Florida fishermen use. Like the coconut, it probably traveled north via the Gulf Stream since glass floats of this type are not used in fishing off the Carolinas." 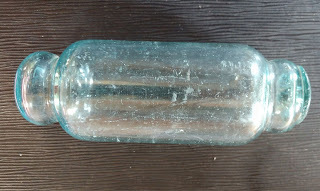 Modern-day beachcombers are unlikely to find glass net floats, but other treasures often wash ashore. Even if you don't find a net float, a scotch bonnet or a hunk of coral, a stroll along Ocracoke's beach is always a good way to calm the soul. I have written in the past about Augustin-Jean Fresnel (1788-1827) whose remarkable invention, the Fresnel Lens, revolutionized lighthouse illumination (see https://villagecraftsmen.blogspot.com/2017/09/ocracokes-fresnel-lens.html). Last month my 14-year-old grandson, Lachlan Howard, wrote a short essay about the Fresnel Lens and its wider use in the theater, solar ovens, cameras, and industry. I had never thought about these alternate uses for Fresnel lenses. We have published Lachlan's essay as our October Newsletter. You can read it here: https://www.villagecraftsmen.com/the-fresnel-lens/. Ocracoke Island's annual Pirate Jamboree begins later this week, and continues for four days. From Thursday, October 25, through Sunday, October 28, Ocracoke will host pirate reenactment crews as they invade by land and sea. But that's just the beginning. Throughout the four days residents and visitors can enjoy musical entertainment, magic shows, history, period encampments, vendors and a live battle with cannons on Silver Lake. Along with all of the swashbuckling events will be a Brigand’s Bazaar, a vendor fair, held in the heart of the festival on the Historic Wahab Estate Lawn, adjacent to the Pirate Encampment. Brigand’s Bazaar will feature local artists in every medium – fine crafts, metal smiths, pottery, jewelry, wood, painting, textiles and more! For more information click here: https://www.visitocracokenc.com/event/2018-blackbeards-pirate-jamboree/. 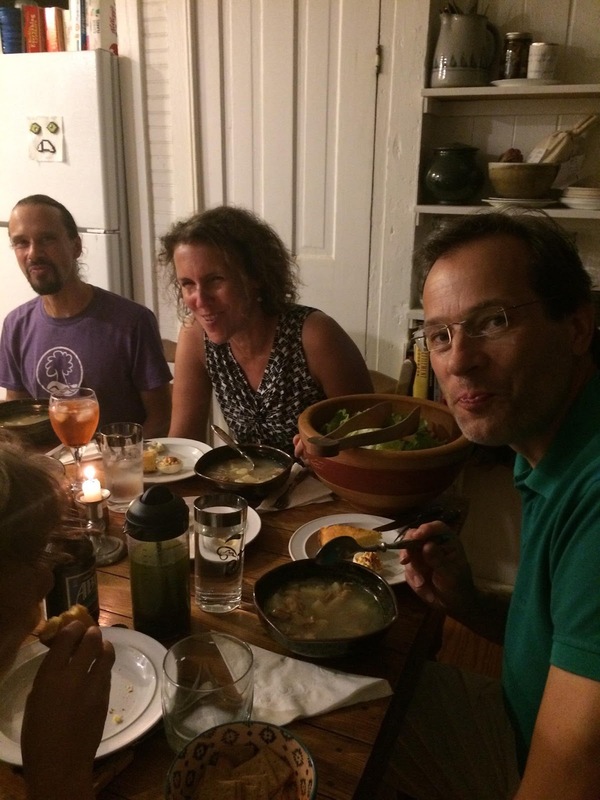 This month's Ocracoke Newsletter is an essay by Philip Howard explaining why he decided to stay on the island as Hurricane Florence approached. You can read it here: https://www.villagecraftsmen.com/why-i-stayed/. Ocracoke Island has been home to many a colorful character. "Rob Hanks" (Robert Dosier Tolson, 1895-1961) was one of the most memorable. In the 1950s Rob offered to tell visitors "the story of Ocracoke and Blackbeard" for a dime. He was short and slight of build. 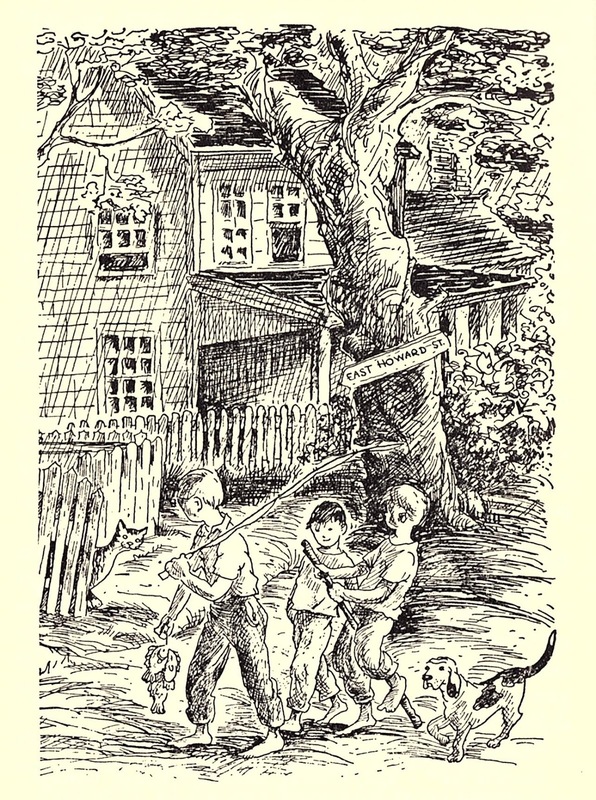 He often wore a white sailor's cap, a jacket, and long pants, even in the middle of the summer. Rob Hanks could usually be found at Springer's Point, near where Blackbeard met his end in November, 1718. I discovered the following paragraph in a newspaper clipping preserved in a scrapbook at the Ocracoke Library, and digitized by digitalnc.org. It was originally published in 1956 or 1957. 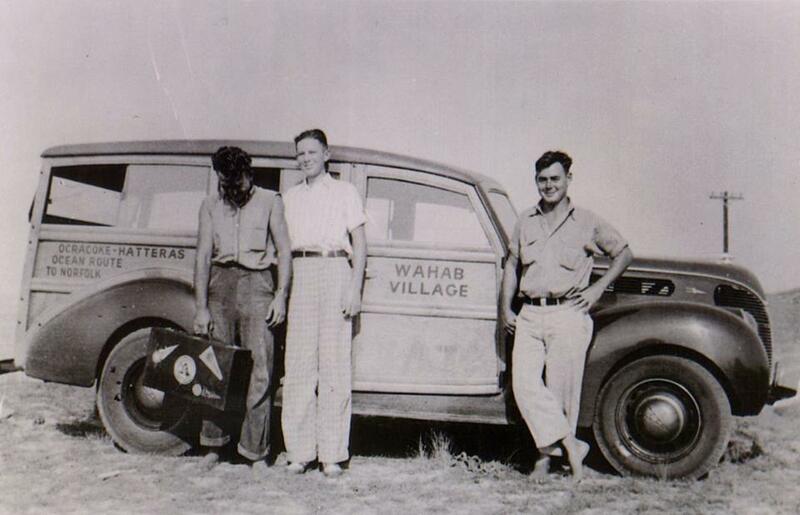 "Charley Mack (C. C. McWilliams to the U. S. Post office Department) drives the Ocracoke bus and mail truck, a battered-looking vehicle with a splintery super-structure like an oversize doghouse on the back. Charley Mack hauls freight and passengers with no discrimination between the two. 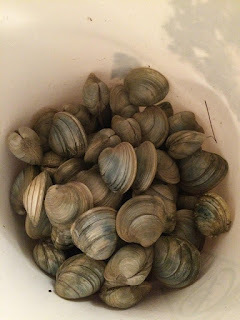 I once made the trip sitting on a wet burlap bag full of clams. But sometimes the freight takes priority, as the time Charley hauled a horse. 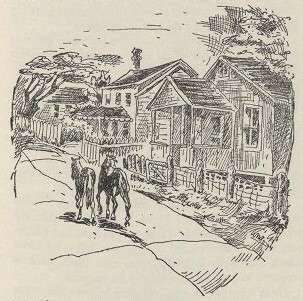 Charley trussed the horse up, gently but firmly, and a bunch of villagers inserted the animal, head-first, into the back of the truck, the horse rode quite comfortably all the way, its head in the lap of a lady shell collector from Quincy, Illinois." Yesterday I received this press release announcing Blackbeard’s Trial—Friday, Oct. 19, 2018. It will be interesting to hear how the judge rules! 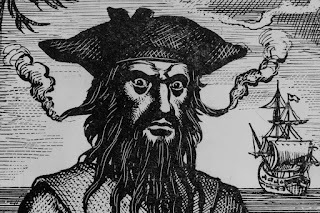 In conjunction with the Town of Bath’s Tricentennial Celebration of Blackbeard, the Greater Bath Foundation announces “Blackbeard’s Trial—A Mock Hearing to Reconsider the Guilt or Innocence of the Pirate Blackbeard and His Shipmates From Bath, North Carolina.” The hearing will be held on Friday, October 19, 2018, at 2 p.m. in the Superior Courtroom at the Beaufort County Courthouse in Washington, North Carolina. The Honorable J. Carlton Cole, Superior Court Judge for the 1st District Superior Court will preside. Seth Edwards, Esq., District Attorney for Judicial District 2, will represent the government of Virginia, Lt. Gov. Spotswood, and Royal Navy Lieutenant Robert Maynard. J. Erik Groves, Esq., an attorney practicing in Waxhaw, North Carolina, will represent Capt. Edward Thatch and his shipmates from North Carolina. Actors will play the roles of Virginia Lt. Gov. Alexander Spotswood, North Carolina Governor Charles Eden, North Carolina Executive Council Secretary and Collector of Customs Tobias Knight, Royal Navy Lt. Robert Maynard, the pirate/slave Caesar, mariner Humphrey Johnston, and Blackbeard. Historian Kevin Duffus will present a summary of historical facts relevant to the objectives of the hearing. In November 1718 and the early winter of 1719 at Williamsburg, Virginia, four trials were held by a Court of Vice-Admiralty to consider the guilt or innocence of the surviving members of the pirate crew of Edward Thatch, aka Blackbeard. That crew, jailed under suspicions of piracy, included men who, according to deeds, wills, and estate inventories held in the Beaufort County Courthouse, were known to have been the sons and slaves of Bath and Pamlico region plantation owners. All of the records from those trials at Williamsburg nearly 300 years ago have been lost. However, by reassembling the facts of the case found in primary source documents, it is possible to fairly retry the case, and reconsider the guilt or innocence of the pirate Blackbeard and his shipmates from the Pamlico River and whether it was lawful for the colony of Virginia to dispatch armed forces into their neighboring colony of North Carolina. Seating will be limited. A portion of the courtroom is being reserved for selected students from Beaufort County Schools. Reservations for admittance will be required and can be made by emailing or calling Paula Weathington, Trial Court Coordinator, at 252-940-4076. All media requests for seating or camera positions should be emailed to Kevin Duffus at kevin_duffus@earthlink.net. Few places in America have a legitimate reason to commemorate the 300th anniversary of the life and death of the world’s best-known pirate-privateer but Bath, North Carolina, is the home of Blackbeard! Bath’s Blackbeard Tricentennial will be held on October 20, 2018 at Bath. Surfmen, employees of the United States Life-Saving Service (there were 279 stations on the east coast, gulf coast, west coast and the Great Lakes), responded to more than 28,000 ships in distress, and saved the lives of more than 177,000 sailors and passengers during the 44-year history of the USLSS (1871-1915). Ocracoke had two Life-Saving Stations, one at Hatteras Inlet (established in 1893) and another in Ocracoke village (established in 1903). Who were these surfmen? "The requirements for appointment were these: Be between the ages of 24 and 45; be able to read and write; know basic arithmetic; be familiar with the conditions of the surrounding waters and be a skilled boatman with the ability to command men under extremely stressful conditions. 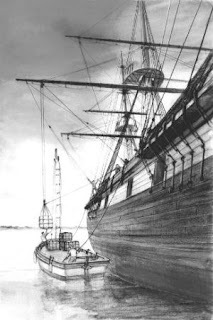 "The keepers were required to hire and train their own crew, who were to be selected from local men familiar with the handling of boats in the adjacent waters. They had to be in good health and under 45 years of age when hired...."
Jack Spencer Goodwin, in his foreword to Williamson's book, writes, "The bravery of the men of the Lifesaving Service is astounding. These men routinely risked their lives (and many lost their lives) attempting to rescue those in peril at sea. That they did not always succeed -- raging nature can mock the strongest efforts of man -- does not lessen their magnificent accomplishments." One of the most satisfying activities is harvesting seafood for dinner. In September we had friends from Berlin, Germany, visiting us. 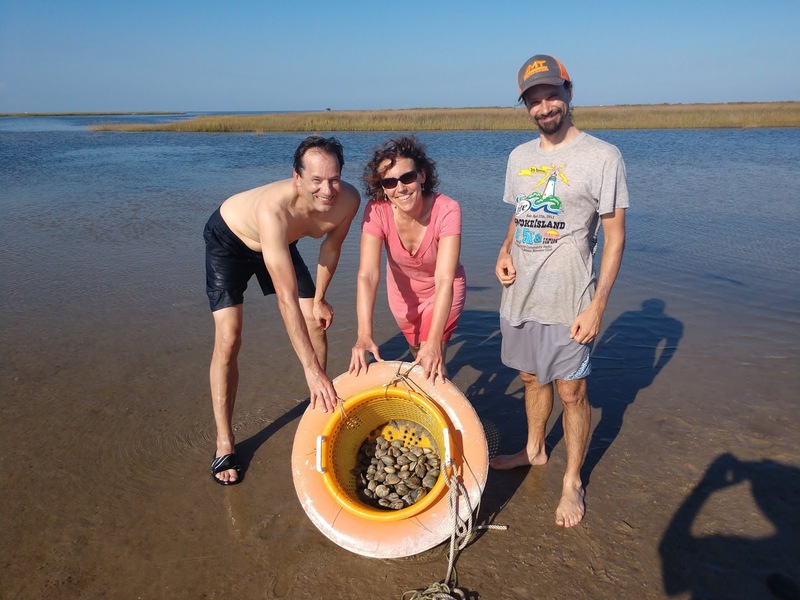 Jule and Christian had never been clamming, so I loaded the clam rakes and baskets into my pickup truck and we headed to an isolated soundside beach. In short order we had gathered almost 150 clams. 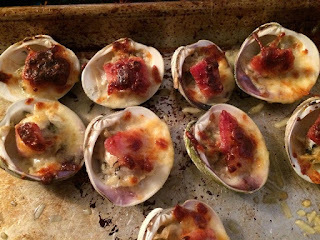 Back home I opened the clams, added a small strip of bacon and some Parmesan cheese, then broiled them for about 10-15 minutes. Clams Casino! The next day I made traditional Ocracoke Clam Chowder (chopped clams, cubed potatoes, fine cut onion, bacon [or salt pork], and water). Two days in a row we feasted on the bounty, fresh from Pamlico Sound. What better way is there to celebrate life on Ocracoke?!? 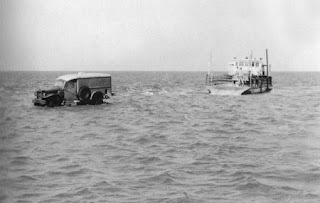 Ocracoke, N.C. – A coupe does not make a good submarine, and there is a lot to be learned about driving along the beach. Aycock Brown drove along the sound side of the island at low tide. His car struck in the mud while tide was flowing. In less than three hours what had been a dry beach was 100 feet or more from land and only the hood of the coupe was visible. Capt. James Henry Garrish, using the regulation life-saving tackle, rescured the car and its driver. Islanders and coast guardsmen assisted in the rescue. I recently came across a book published in 1900, Plant Covering of Ocracoke Island; a study in the Ecology of the North Carolina Strand Vegetation, by Thomas H. Kearney. In it the author lists the "normal monthly temperatures" at Hatteras as well as the "normal daily range of [monthly] temperatures." I have used these figures to calculate the "weather averages" as listed in the second column below. The first column below lists weather averages from NOAA for 2018. As you can see, the 2018 average high temperature (compared to 1900) varies from 1° higher (January) to 5° higher (April), and the 2018 average low temperature varies from 0° (January) to 4° higher (April). Every now and then a pelagic bird (a bird that spends most of its time on the open ocean) will visit Ocracoke. This sometimes happens when an albatross or other exotic pelagic bird is blown here during a gale or hurricane. I recently learned about Brian Patteson's Hatteras Island based Seabirding Pelagic Trips. Trips to the Gulf Stream aboard the Stormy Petrol II take place year around. 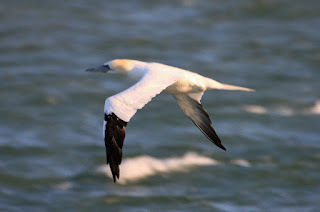 As their web site explains, "the Gulf Stream off Cape Hatteras is probably the most consistent (and convenient) place in the western North Atlantic for finding a variety of pelagic seabirds on any given day. Getting there usually only takes between 2 to 2.5 hours of traveling each direction, so most of our day is spent in or along the Gulf Stream." As I write, Patteson's enterprise still has space on several more trips to the Gulf Stream in October. If this fall is not a convenient time for you, or you would like more information about seabirding, check out Brian's web site at http://www.patteson.com/ . Marsden Mats were originally developed by the US military during WWII for use as temporary runways and landing strips. Approximately 2 million tons of this material was produced, at a cost of about $200 million. 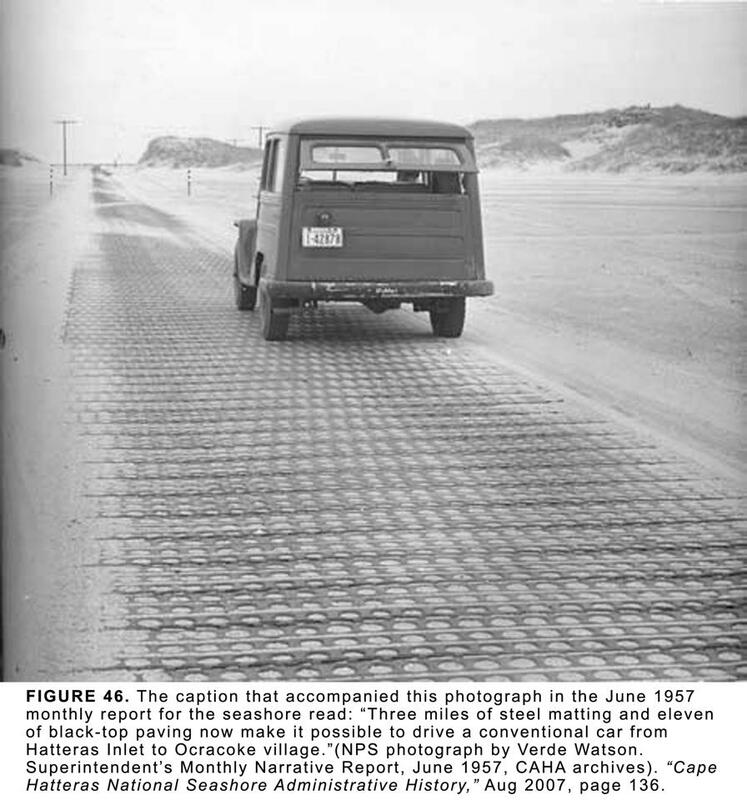 After the war these landing mats were laid down on Ocracoke Island soft sand to serve as roads. 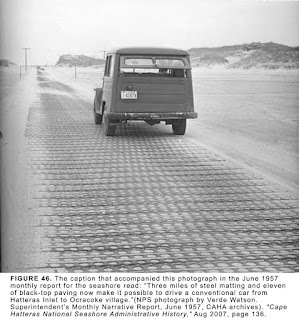 In 1957 a three mile section of landing mats at the north end of the island joined the nearly completed hard surface road (NC12) that, for the first time, connected Ocracoke village to Hatteras Inlet. The caption that accompanied this photograph in the June 1957 monthly report for the seashore read: “Three miles of steel matting and eleven of black-top paving now make it possible to drive a conventional car from Hatteras Inlet to Ocracoke village.” (NPS photograph by Verde Watson, Superintendent’s Monthly Narrative Report, June 1957, CAHA archives). “Cape Hatteras National Seashore Administrative History,” Aug 2007, page 136. Your “port” on Ocracoke is composed of several clusters of pilings. The ferry lets its ramp down on a piece of mesh landing strip laid across the beach. You drive off onto this – then discover that it’s your road. For three miles, across the low sandy northeastern end of the island, you drive on metal mesh little wider than your car. At frequent intervals another width is laid beside the “road” to make passing possible. Finally you reach higher ground – low dunes with scrub palmettos and evergreen yaupon on them – and the black top road that was completed last year [sic]. 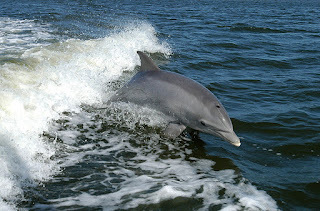 In marshes bordering the sea or Pamlico Sound you begin to see some of the wild ponies for which Ocracoke is famous. From MotorBoating Magazine, Jan, 1932"
"At two o’clock the next day we left for Hatteras Inlet at the northernmost end of Ocracoke. As the tide was up, we could not drive the beach, but took the inland road through the sand dunes. Our chauffeur drove his hard pressed Ford with calloused bare feet. Much of the road was loose sand which must be traveled at a fairly high speed to prevent stalling. This made it necessary to charge through these bad places, which resulted in some terrible shocks and jolts to the car, as it jerked through the crooked ruts. The thousands of sand crabs seemed to have selected the wheel tracks for doorways to their underground homes and this did not improve riding conditions. As the state spends nothing on these roads, no license plates are required. "Before we discharged our jitneyman at Hatteras Inlet Coast Guard Station, we asked the Commander there if he would take us across to Hatteras, a distance of five miles. He told us he would take us over right away if we wished to go then, or at 4:30 when he went for his mail. We had no reason to go over sooner so we prowled the beach for an hour or so. After having a cup of coast guard coffee, we were taken across Hatteras inlet in a motor whaleboat. The coast guardsmen down there would delight the eye of a college football coach. They are all fine physical specimens. Most of them weigh two hundred pounds each and average six feet tall. The older men seem as fit and as active as the younger men. The channel from the ocean into the sound is similar to that at Ocracoke Inlet, in that it divides, and deep water follows close to the two islands. About 12 feet can be carried into both Ocraocke and Hatteras inlets, and from 4 to 6 feet into Origon inlet, which is south of Bodie Island light, but the channels are shifting and local knowledge is necessary to safely navigate them." These small (about 2" long, not counting the "horns") organic pouches found on our beaches can be somewhat pliable or rather rigid, but they are quite durable. I learned to call them Devil's Pocketbooks, but more romantic beachcombers call them Mermaid's Purses. These fascinating objects are actually skate egg cases. Island resident Crystal Caterbury has written an informative article (with photos) about these egg cases in the Ocracoke Current. You can read it here: http://www.ocracokecurrent.com/126604. 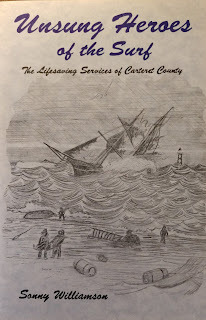 The hurricane of September 7, 1846, struck the Outer Banks most powerfully twenty to fifty miles north of Portsmouth island, but it led to the demise of the village of Portsmouth. Why was that? The hurricane was a powerful, slow-moving tropical system that brought gale force winds, sudden squalls, and a rushing surf that destroyed almost everything in its path. But Portsmouth village was spared the brunt of the storm. Nevertheless, the results of the hurricane precipitated the slow abandonment of Portsmouth village. By 1971 the last of the residents left the island, leaving behind their church, the post office, the Coast Guard station, and a dozen or more houses. Today, Portsmouth is a ghost town. I am wondering if any of our readers can explain why this storm led to the death of Portsmouth. If you know, please leave a comment. If you do an internet search for the USS Monitor you will discover that this famous sunken Civil War ironclad vessel was located at the bottom of the Atlantic Ocean in 1973 near Cape Hatteras. I remember well an excited chat I had in the Village Craftsmen with a reporter for the Washington Post at the time of the discovery. Leatherneck Skin Diver Claims Monitor Found Off Buxton, N.C.
A 21-year-old Marine skin diver confidently announced last Sunday he has found—and touched with his own hands—the sunken hull of the famous Yankee Civil War ship, the Monitor, according to an Associated Press dispatch. In fact, he says, he has stuck a note to that effect in one of the vessel’s gun ports. One historian, expressing some doubt, said that if Marx is right he has scored the “coup of the century” in naval history. For nearly a hundred years, men have searched in vain for this historic vessel. A little digging on the internet rewarded me with more information about Robert Marx's adventure. You can read Clay Blair's detailed account in his 2015 book, Diving for Treasure and Pleasure. In spite of Marx's 1955 claim, official reports tell a different story. According the Monitor National Maritime Sanctuary website, in 1973 "a team of scientists aboard Duke University Research Vessel Eastward located the shipwreck remains of what they believed to be the USS Monitor lying upside down [not right side up] in 230 feet of water [not 50 feet of water], approximately 16 miles [not one miled] off Cape Hatteras, N.C. A 1974 expedition confirmed that the shipwreck was in fact the Monitor." Buxton. — Knowing absolutely nothing about the habits, haunts and inner character of the Porpoise, I feel that I can speak freely. To me, they seem friendly. They may have the blackest hearts of all the fish in the sea. Being mammals, like us, this might well be. They always seem to be smiling or grinning, and playful. Anyway, I like 'em. Lately, off Cape Hatteras can be seen the phenomena of fishes flying, although they aren't flying fishes. They're baby porpoises and their mother's are teaching them, of all things, the fine art of breathing. A porpoise, as all porpoise lovers know, has a rather nasty habit of bumping. This would be apt to get anything but another porpoise a punch in the snoot, but it is their way of manifesting either affection or anger. The oomph behind the bump is calculated to measure the amount of emphasis needed to suit the occasion. Naturally, with a new-born baby porpoise, a careful, somewhat loving little bump will at first suffice to get him out of the water and into the air, where he can take himself a helping of the breath of life. For, believe it or not, he requires from the start, the very same air we breathe, minus the smog, to sustain life. For the porpoise is: "A warm-blooded mammal that suckles its young on milk and would drown if it did not frequently rise to the surface of the sea to breathe air." The baby porpoise, of course, does not understand all of this, never having read the encyclopedia, hence the game of "bumpsy." Just about every species of fish that swims in the sea has been caught at some time or another off the beaches of the Outer Banks. Even the sawfish and the headfish Game fish and pan fish are plentiful. When the season runs out on one species, two or three other varieties arrive in time to steal your bait. But they're all fickle and seasonal—except old "gandi-dancer," the porpoise.. He stays with me all year. When you are flying alone and the ocean is glassy-smooth and there's no sign of life on sea or shore, it's lonesome. Then a porpoise cuts the surface, making a graceful ripple. Another one makes a smooth, surfacing maneuver, and then another. You can follow their track as they dive and surface, dive and surface. Sometimes the whole ocean is alive with the creatures. And what do you know, they're all going my way! 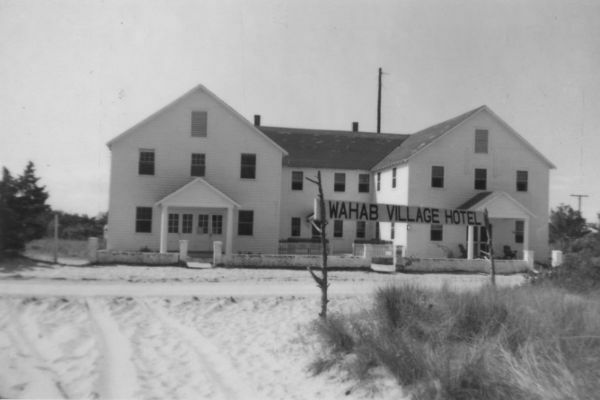 Stanley Wahab who is developing Wahab Village on Ocracoke Island is advertising in the News and Observer an October Fishing contest on the island with a series of prizes, cups, tackle and fishing equipment generally, offered as prizes. 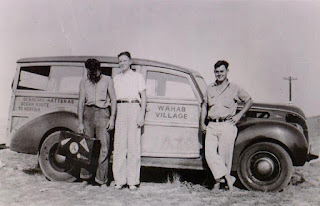 The rates for guides in the Wahab sponsored contest is $9 per day for one person and guide, $7 per day for two persons and guide and $6 per day for party of three and guide…. And incidentally the October fishing, if weather is favorable, will be good. It always is at Ocracoke.